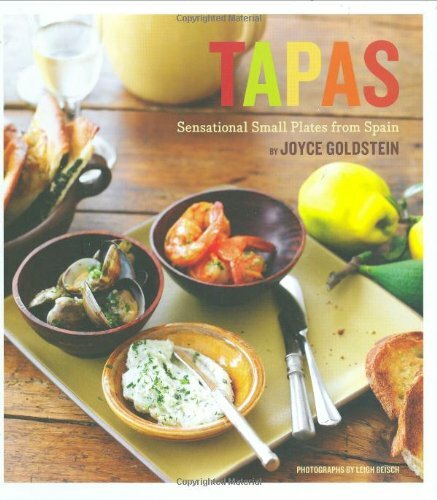 An expert in Mediterranean cuisine, Joyce Goldstein brings the warmth of Spain across the Atlantic with this delightful array of tapas recipes. These treats are small, savory, and perfect for an evening in with friends. Whether reliving a delicious trip to a tapas bar in Spain or discovering these small-plate delights for the first time, readers will find Goldstein’s 60 recipes authentic, easy to make, and pleasing to the palate. Nothing could be a better accompaniment to a lingering glass of Catalonian wine than a few bites each of Fried Marcona Almonds, Chorizo Sausages Sautéed in Cider, and thin slices of Serrano Ham. With a short history detailing the origins of Spanish cooking, Tapas will have crowds of fans asking for más. For twelve years she was Chef and Owner of the ground-breaking Mediterranean Restaurant, SQUARE ONE, in San Francisco. Her menu presented the foods of Italy, Spain, France, Greece, Turkey, the Middle East and North Africa. SQUARE ONE won numerous prestigious industry awards for food, wine and service. She also ran the very successful Caffe Quadro which served pizza and sandwiches next door to her flagship SQUARE ONE. Prior to SQUARE ONE, Joyce was chef of the Cafe at Chez Panisse for 3 years. She also served as Visiting Executive Chef of the Wine Spectator Restaurant at the Culinary Institute of America at Greystone in the Napa Valley. Joyce was founder and director of the California Street Cooking School, San Francisco’s first international cooking school and taught kitchen design for the University of California’s Department of Architecture. Joyce was elected to Who’s Who in Food in 1985. She was voted San Francisco FOCUS magazine’s Chef of the Year in 1992. She received the James Beard Award for Best Chef in California for 1993 and in 2005 was awarded the Lifetime Achievement Award from Women Chefs and Restaurateurs. Joyce is a Founding Member of the Board of Directors of the Association of Women Chefs and Restaurateurs and serves on the Awards Committee for the James Beard Foundation.